You may remember our blog “Impact Investing: Aware, Unaware, and Just Don’t Care”, in which we acknowledge that many advisors are unaware to impact investing, or just don’t care about it until they hear a story that leads them to their Impact Aha! moment. This story can be from a fellow advisor who has attracted many millennial investors, from a fund company outperforming their competition or from a seminar discussing the imminent $30 trillion dollars in wealth transfer with much of it expected to go ESG. 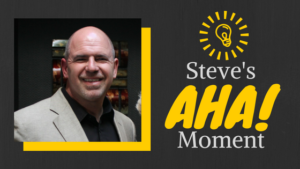 If you have not had your Aha moment yet, we’d like to share two stories in hopes that you will be inspired and enlightened. In 2013, our CEO Steve Distante was sitting with his friend Chintan Panchal, an attorney. The conversation turned to Steve’s desire to align his personal passions and values with his business, when Chintan explained Impact Investing. Chintan’s law firm, RPCK Rastegar Panchal is dedicated to structuring and advising their clients from an impact investing perspective. Steve’s Impact journey began that day as he discovered how to tie his personal passions with his broker dealer and RIA, Vanderbilt Financial Group. Since then, Steve has founded Impact U, an online community focused on connecting main players in the Impact Space and pushing the movement forward through education, collaboration, and crowdfunding. As a champion of the space, Steve has received speaking engagements and interviews like the one published by InvestmentNews on July 25th, “Independent Broker-Dealer Vanderbilt Revamps to Focus on Impact Investing” by Liz Skinner. Jeff Gitterman had a very similar experience to Steve’s as he explains in the August/September 2017 issue of Morningstar Magazine. In the article, “Re-Energized by Sustainability: A Shift to ESG helped Jeff Gitterman rediscover his passion for the profession” by Ilana Polyak, Jeff discusses how his Impact journey began. For a while, Jeff was expressing his passion for ESG through projects in his personal life, like being a producer for the film Planetary which explores our relationship to our environment, and through his book, consulting company and radio show, Beyond Success: Redefining the Meaning of Prosperity which focuses on success and happiness not just in a professional sense but in all aspects of one’s life. 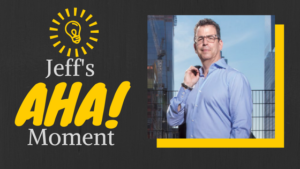 A Financial Advisor for over 25 years, Jeff established a successful firm, Gitterman Wealth Management, made up of a team of advisors managing $450 million in assets. In 2016, Jeff had the same desire Steve did, and set out to create ESG portfolios. Within a year, the firm was able to move $20 million into their newly created ESG portfolios, called SMART Portfolios (Sustainability Metrics Applied to Risk Tolerance). Two Impact Enthusiasts are Better than One! In 2017, Gitterman Wealth Management made the decision to leave their broker dealer to go somewhere that valued and supported their ESG focus. When they discovered Vanderbilt, The Sustainable Broker Dealer, they knew they found an accepting and innovative firm that would take their SMART Portfolios to new heights. 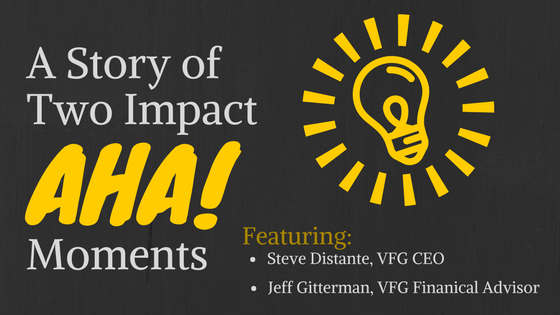 Now that you’ve heard Steve and Jeffs’ stories, you may be feeling more like an “Impact Aware” financial advisor. Ready to take the next step? Join us in New York City on October 19th for the Sustainable Investment Conference to learn how you too can adopt Impact Investing and easily incorporate this investment strategy into your practice to drive growth and find passion and purpose in your profession. This content is property of Vanderbilt Financial Group and is not to be duplicated or redistributed without prior written consent. Not an offer, recommendation or solicitation to buy or sell. Further Information is available upon request. About Vanderbilt Financial Group: Founded over 50 years ago in 1965 and located in Woodbury, NY, Vanderbilt Financial Group is the Entrepreneurial Broker Dealer known as the Sustainable Broker Dealer and RIA committed to investing with purpose. Vanderbilt is a full service Broker Dealer and Advisory firm with a focus on Impact Investing. Vanderbilt’s refreshing, unique, and innovative culture is a driving force to constantly strive to positively impact their community.